It’s fall which means only one thing to me…Pumpkin in everrrryyyyttthhhinggggg! 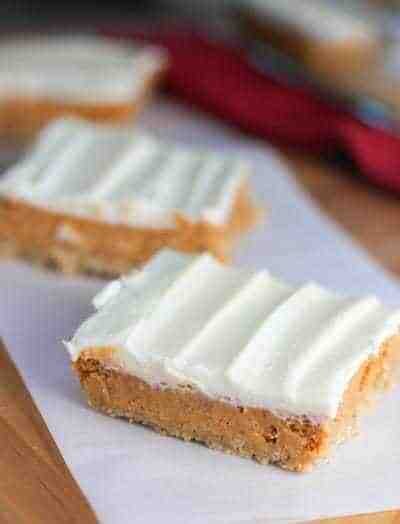 First up is Pumpkin Cheese Cake Bars. Cheesecake with frosting on it….how can you go wrong? 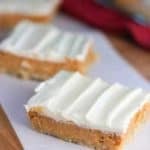 I brought a few of these Pumpkin Cheesecake Bars to work and my pal Dana went bonkers…no really, I thought she was going to choke sucking the bits of pumpkiny goodness from her paper napkin! I finally offered her up another to save myself from having to perform the heimlich …. what are friends for? I’m a bit of a cheater cheater pumpkin bar eater with the frosting. Store bought…yup. Go ahead judge me if you will, but time is a precious commodity and I didn’t have time to be whipping up homemade frosting that day. Now, that being said, I did share the homemade version below. I want you to do better! But in a pinch, buy a can and move on…. The only special note I would add are these need to be fully chilled before you cut into them. Overnight would be best but 2 hours will do ya. Spray a 9 x 13 in baking dish with cooking spray. Combine all crust ingredients in a food processor and pulse until crumbly. Using an electric mixer, beat cream cheese and sugar until smooth. Add pumpkin purée , vanilla, pumpkin pie spice and salt and beat for a few more minutes. Add eggs one and a time and continue to mix until well blended. Pour onto cooled crust and bake for about 45 minutes or until a toothpick inserted in the center comes out clean. Cool completely in the fridge. Couple hours or over night. Using an electric mixer, blend all frosting ingredients until smooth and spread on cooled cheesecake. Back in the fridge for an hour or two and slice up! Store in the refrigerator. Looks wonderful! Definitely will try in the coming weeks. Oh my GODDDDD this looks incredible!!!! As if cheesecake wasn’t sinful enough but that frosting looks so so so good. I really am going to have to make these for my roommates. I actually just whipped up a sort of light/low fat pumpkin mousse in a phyllo dough shell in the spirit of Fall and am planning on making a sort of Greek yogurt pumpkin cheesecake this week but now I’m thinking “forget trying to be healthy” cuz your bars look way tastier!!! These look delicious! I just wanted to let you know that I have a website (Simply Creative Recipes) where I showcase recipes that I find and I am linking to this post if you don’t mind. 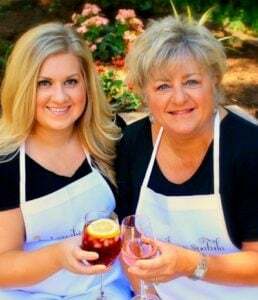 You are welcome to submit your recipes to my site if you’d like. Thank you for posting my pumpkin bars! I am happy to share and appreciate your invitation! Oh yum, who doesn’t love pumpkin everything!? These bars look amazing. It’s still in triple digits where I live (hello, desert), but I am SOOO ready for fall and pumpkin! We actually planted our pumpkins a bit early this year and they have been decorating my dining room since the end of July! I need to bake them up soon and turn them into some delicious puree! Fresh pumpkin puree! Wow…thats spectacular. You should be dishing up some killer pumpkin recipes anytime…cant wait! Oh my Kathy, this post just got me SO excited! It’s definitely time to pumpkin EVERYTHING! This looks delicious. Will have to make these ASAP. Holy yum! I am so in pumpkin mode right now, too! I want pumpkin everything! This is definitely on my to-make this because I know my daughter will go gaa-gaa over it! Hi Amanda! They are a real treat! I think they would be good without the frosting and maybe just a touch of powdered sugar if you need to cut back to keep the kiddo’s off the ceiling! Hope they love ’em!